Detailed Specification for Model CT03. Cozy Pet Cat Trees are made from the highest quality materials with deluxe thick plush material. Our Cat Trees are available in twelve of the most popular designs. 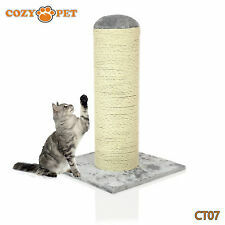 Cat or Kitten Play Scratcher - Three Scratch Poles Mouse. Cozy Pet Cat Trees are made from the highest quality materials with deluxe thick plush material. Our Cat Trees are available in twelve of the most popular designs. (Cheaper cat trees use much thinner sisal.). Detailed Specification for Model CT05. Cozy Pet Cat Trees are made from the highest quality materials with deluxe thick plush material. 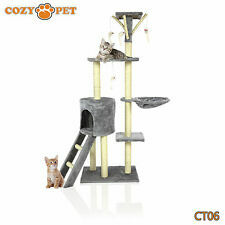 Our Cat Trees are available in twelve of the most popular designs. Detailed Specification for Model CT07. Cozy Pet Cat Trees are made from the highest quality materials with deluxe thick plush material. 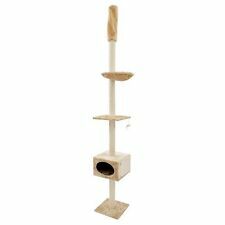 Our Cat Trees are available in twelve of the most popular designs. Detailed Specification for Model CT10. Cozy Pet Cat Trees are made from the highest quality materials with deluxe thick plush material. 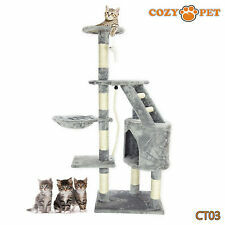 Our Cat Trees are available in twelve of the most popular designs. Detailed Specification for Model CT09 (New 2017 Design). Cozy Pet Cat Trees are made from the highest quality materials with deluxe thick plush material. 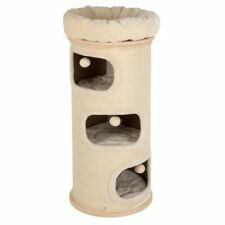 Our Cat Trees are available in twelve of the most popular designs. The Bear Paw cat tree gives your cat lots of choice where it would like to sleep and laze around. There are 4 paw-shaped levels; covered in soft plush, each level is cosy and comfortable. Bear Paw Cat Tree With Four Cosy Places To Sleep. Detailed Specification for Model CT12. 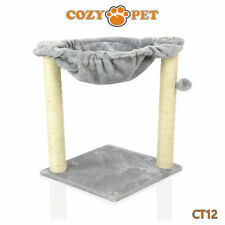 Cozy Pet Cat Trees are made from the highest quality materials with deluxe thick plush material. 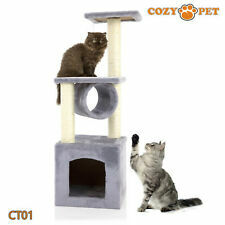 Our Cat Trees are available in twelve of the most popular designs. Detailed Specification for Model CT01. Cozy Pet Cat Trees are made from the highest quality materials with deluxe thick plush material. 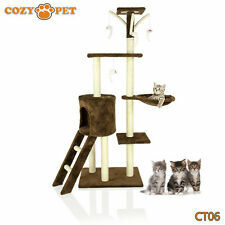 Our Cat Trees are available in twelve of the most popular designs. All Come Complete With Non-Slip Feet Fitted. The cushions in the beds are very soft so your cat can snuggle into them when it wants to have a nap, and they can also be removed for washing. The cushions are reversible, with cream fabric on one side and beige on the other, so you can alter the look of the tree by flipping them over, to either match the lighter colour of the pillars, or the darker colour of the beds. with soft plush/felt cover posts wrapped in natural sisal cave fitted with felt reversible cushion: washable by hand hammock with stable metal frame colour: white/blue . Now Buy 1 Get 1 Cat Scratcher 1 Catnip for FREE. 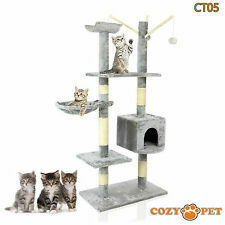 Multi-level platforms with 2 perching area, 1 condo house, all sisal scratching poles, 1 hanging toy mouse on top platform, as well as a plush covered climbing ladder, providing lots of space for your loved to enjoy the high-jump play and nap indoor healthily and safely whenever they like. The beds all have soft, reversible cushions to sleep on, and you can choose whether to place them with the cream coloured side up, to match the water hyacinth beds, or use the beige side to tone in with the natural colour of the pillar and base. New Young Fashion ROSEY colour. 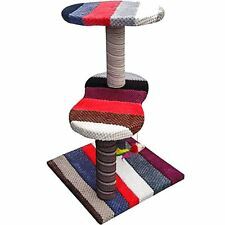 It combines scratching, perching, climbing, all play, fun & nap just in one centre place. It provides lots of fun for your loved to enjoy the high-jump play and nap indoor healthily & safely whenever they like. We realise that you want your stuff as soon as possible. Provide your cat with hours of fun trying to catch that pesky mouse in the tunnel which dangles from a cord. It's so close yet always so far! with plush cover posts wrapped in jute cave fitted with plush cave with reversible cushion: washable by hand platform with removable cuddly bed cuddly bed with reversible cushion: washable by hand with toy on string colour: light taupe/cappuccino . Catwalk collection unique and robust scratcher. Hours of fun and activity to keep your cat fit. Big saving RRP £24.99. It has a raised cat basket made from elegant water hyacinth. And to complete the picture, there are two cute little plush toys dangling from the basket. 45 x 45 x 54.5 cm (L x W x H). Natural materials: Genuine wood, sisal and water hyacinth. 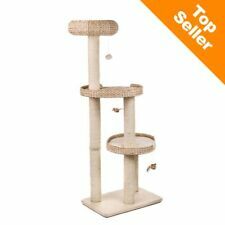 Keep your feline friend entertained for hours with the Milo & Misty 3 Tier Cat Play Tree. Purrrfect for scratching, stretching, exercising or enjoying a peaceful cat nap away from the rest of the household. Great choice for your cat to stretch and have exercises on, especially in the cold winter months when your cat may be stuck indoors. Board material: Pressed wood. Natural durable 2/3 sisal rope, soft plush, no harmful substances. Cat Scratch Pole. - With Play Ball. - Perfect for care of their claws. Bell Ball Toy Can Beep, Lure The Cat To Play. Strong Base, Can Support The Entire Shelf Stability, Convenient Cat To Play, Provide A Solid Foundation. Sturdy Construction, Safety, Non-Stimulating, Wear And Grip Resistant. 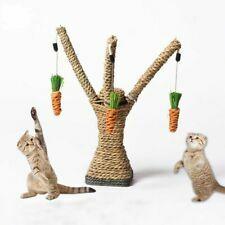 FEANDREA cat trees have all the characteristics you need to make your cats flourish. FEANDREA Notes - 1 x Cat Tree. - Place this item on a level floor in a room corner. Dual Condo Playhouse - Creates a perfect hide-out and napping spot for your active kittens and cats. The roomy den with its little rounded balcony is ideal as a place to hide, or a lookout spot for cats who like to be up high. Both snuggle beds have a padded border, allowing your cat to curl up safely inside and dream of exciting adventures.